Size: 5.5" x 2" x 1.75"
While the Celts are better known for their later works (from 450 BC to 15 BC), they began as an Indo-European culture around the lower Volga River. The first evidence of these formidable warriors was found in Halstatt, Austria about 600 BC. 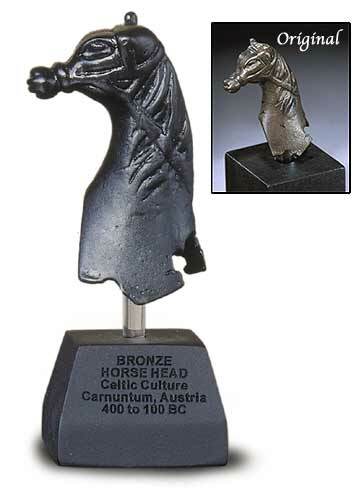 The horse was important to their culture and critical to the success of their expansion through Europe to the Atlantic. Their early domestication of the horse and superb use of cavalry made them a threat to Rome. Celtic warriors used the bridle and stirrup to full advantage, often riding two to a horse. While charioteers, with a javelin thrower on board, were devastatingly effective. Fearless and frightening in battle, they often scattered more disciplined Roman legions, which referred to them as galli. Their reverence of the horse led to the cult of Epona, the patroness of horses, found throughout Europe. 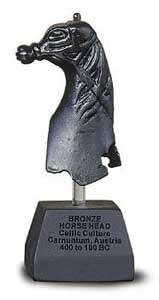 This beautiful bronze piece is an exact replica of the original late Bronze age artifact. Its use - as a devotional piece on the altar of the horse goddess, as part of a childs toy, or as a warriors burial piece - is lost in time. The impact of the Celts and their reverence for nature endures to this day.